The rugged terrain near Gibbonsville, where Lewis & Clark decided to leave the trail. 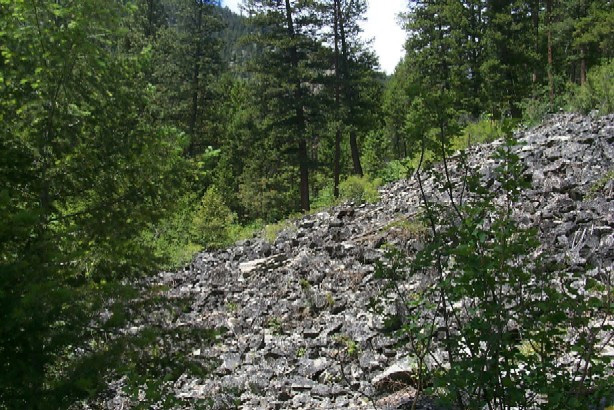 Courtesy U.S. Forest Service. On August 30, 1805, Meriwether Lewis and William Clark undertook what was perhaps their most perilous adventure. For two weeks , the Corps of Discovery had lived among the Shoshones, Sacagawea’s people, in their remote mountain home on today’s Montana-Idaho border. Despite their best efforts, Lewis and Clark had failed to find an easy path to lead their men forward through the rugged, treacherous mountains that lay ahead. It was clear that the only way forward was straight though and damn the consequences. They bought 29 horses from the Indians, hired a Shoshone guide named Old Toby, and once again turned their faces west. In fact, their iron-willed determination to continue west almost led to the unraveling of the entire expedition just two days after they resumed their journey. Old Toby had shown the captains a well-worn, if rough and hilly, Indian path that would lead to the Bitterroot Valley, the logical entrance to the crossing Lewis & Clark needed to make. This ancient trail wound back east through the “Big Hole” Country (later the site where Chief Joseph and the Nez Perce were stopped on their attempt to flee to Canada to avoid being forced on to a reservation )and was about 35 miles long. By this route, the Expedition would recross the Continental Divide at a place known today as Gibbons Pass. The sheer crumbling slopes of the North Fork. This may have been the most difficult terrain encountered by the Corps of Discovery on their entire journey. Courtesy U.S. Forest Service. It was a tedious and long journey that involved something Lewis always hated – doubling back, or what he called a “retrograde march.” Undoubtedly there was an involved discussion between Lewis and Clark and Old Toby about other options. In the end, the captains and the Indian guide got a little cocksure. They decided to leave the beaten path and set off cross-country, confident that they could hack out a shortcut that would shave at least a day off their journey. This horrid bad going where we came up this creek which we Call dismal Swamp was six miles and we are not out of it yet. This is the ground Lewis and Clark ascended in the sleet and snow. Courtesy U.S. Forest Service. The next day was, if possible, even worse. 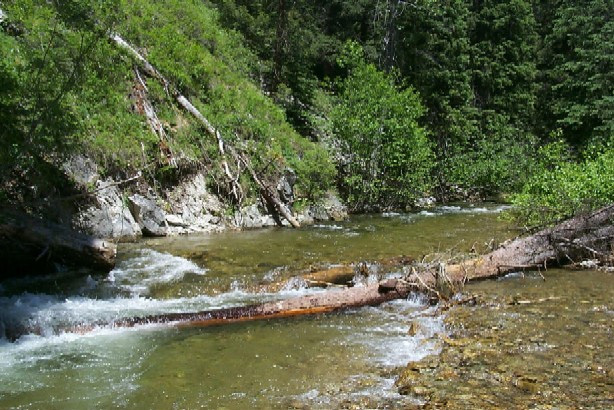 As James Fazio documents in Across the Snowy Ranges, the Corps had descended into a bottomland choked with thickets of briars, willows, and fallen logs, a place where the ground was nothing but sharp broken talus, a place where men and horses stumbled and slipped on steep, almost vertical slopes. Now there was nothing to do but climb out of it – a climb of some 2300 feet. Then it began to rain. As they climbed, the rain alternated with sleet, then turned to snow. Several more horses took bad falls. The Corps somehow struggled to the ridgetops somewhere in the vicinity of today’s ski runs at Lost Trail Pass. Cold and wet, the party shared a meager supper of nine grouse – all the hunters could find – and a little parched corn that had been carried all the way from Fort Mandan. It is debatable, by the way, whether Lost Trail Pass is a Lewis & Clark name, though it certainly fits with their experience there. 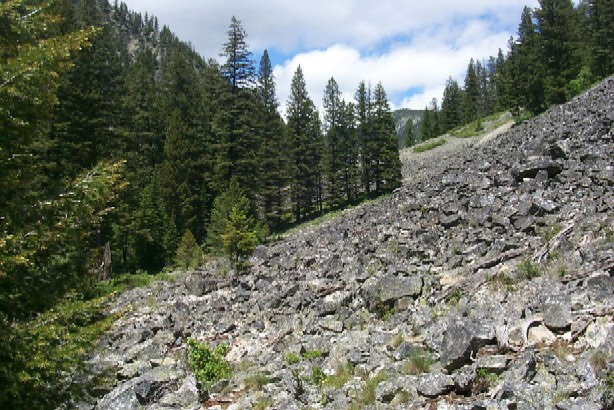 The pass is not named on any map until 1854, when Isaac Stevens called it “Big Hole Pass,” and many historians believe “Lost Trail” was first applied as a nickname after an 1871 surveying crew got lost in the same area that had flummoxed Lewis & Clark. The pass was officially designated as Lost Trail Pass in the early 20th century. Lost Trail Pass. Courtesy U.S. Forest Service. proceeded down a small valley about a mile wide, with a rich black soil; in which there are a great quantity of sweet roots and herbs, such as sweet myrrh, angelica and several other, that the natives make use of, and of the names of which I am unacquainted. There is also timothy grass growing in it; and neither the valley nor the hills are so thickly timbered, as the mountains we had lately passed. By that afternoon they had come to a beautiful village of the Salish Indians in a place now called Ross’s Hole. The Indians draped buffalo robes around the weary travelers and gave them gifts of dried cherries and serviceberries. This exhilarating meeting was brilliantly imagined by Charles M. Russell in his masterpiece at the Montana State Capitol. Lewis and Clark couldn’t have known it, but their ordeal at Lost Trail Pass was only a taste of what was to come. Their greatest trials in the Bitterroots still lay ahead. 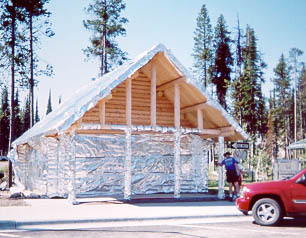 Park buildings were wrapped in something that looked like aluminum foil to try to protect them if the blaze came that way. I am very desirous of going back to this country. When we visited, there was a major forest fire going on near Lost Trail Pass. We had to be escorted in by a “pilot car,” which keeps visitors from wandering off into the fire area, and it was not possible to explore around the area. I was touched by the courage and dedication of the firefighters, who looked dirty and extremely weary. We got to see the “fire camp” where they had pitched their tents, and the preparations to save pricey park buildings if the fire passed over Lost Trail Pass. I guess it really doesn’t hit me that Lewis & Clark had such a difficult time in Idaho. That may be because I live in a different part of the state and don’t often realize how treacherous the mountains are. I can’t imagine trying to cross the mountains on foot! One thing I didn’t realize until pretty recently was that for the most part, they weren’t riding the horses they bought from the Shoshones, either. Those were for packing their equipment and supplies. The idea of them crossing the Bitterroots in moccasins fills me with awe! I heard many years ago while working and living in Idaho that the pass received it’s name after the mayor of Missoula held a big party on the pass, complete with woman and booze for the survey party who was doing a survey along the continental Divide so as to determine the boundary between Idaho and Montana. 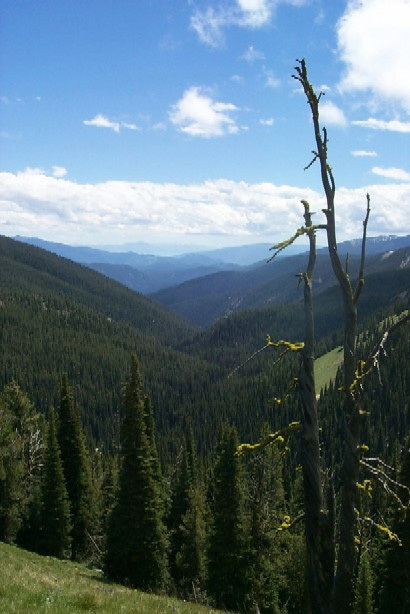 The mayor did not desire his area to be in Idaho,so he got the survey crew messed up with a hangover and pointed them toward the Bitterroot ridge instead of the C.Divide.